Now that Thanksgiving and the black Friday shopping is over, I’m looking forward to Christmas! It’s my hubby’s favorite holiday season. He had our Christmas tree up before Thanksgiving and decorated the house all by himself! Thank you! Now he’ll be wishing for a white Christmas as he does every year. What a kid! I love this sweater dress for its versatility and comfiness. For a colder weather outfit, I’d add a faux fur vest or a jacket and warmer boots. It could also be paired with skinny jeans or jeggings for a casual look, or I could dress it up with opaque tights, heels and a dressier belt. Maybe for another post? Thank you for visiting and happy weekend everyone! Wow hubby putting up the decorations, that’s really nice. I love putting up decorations, such a wonderful time of the year. Your outfit is so fab. The sweater dress is so pretty on you and versatile and I love your boots. Tobi is so cute, he’s smiling. Thanks JT! Isn’t Tobi sweet? Hi Sam, Thank you! I need to find a red one for Christmas. Did you venture out for black Friday shopping? What a mistake that was. I’ll never do that again! (I say that every year) Haha. Have a wonderful week! I love sweater dresses too. What a great holiday look. Thanks so much for sharing on Monday Mingle. Hope to see you there again soon! Hi Nicole, Thanks for letting me share! You look super chic yet comfortable..the best way to dress! Cozzy! I’ve been thinking… you should change the name of your blog to 30 something and rocking it;) !!! You look so good in this outfit. I love those boots! You have a sweet doggie. The fireplace looks so inviting and lucky you to have a husband who does Christmas decorating. Hi Debbie, Thank you so much! Hubby knows if he doesn’t do it, it might not get done before Christmas. He loves this time of the year! What a versatile dress! And I am lusting after those boots. You have such a great fireplace – perfect for the holidays. Hi Adrienne, Thank you, and I do love to sit by the fire with a good book. Thanks Kim! I hope you’ll feel better soon. Hi there! Thank you so much for your sweet words and your visit! So cozy and beautiful! To answer your question, I don’t think I have anything that is quite so versatile as that. If I had to choose, I’d probably say my suede jacket — simply because it can dress up a casual outfit or “casual up” more tailored items. Love your dog, by the way. So cute when they want to be in the picture! Hi Anne! I love jackets…any type really. Absolutely agree that they are very versatile. Tobi is always around me and yes, he does like to be included, and he makes the pics sooo much better. Thanks for stopping by. The sweater dress is such a classic…. It looks marvelous with those boots! Thank you so much and glad you stopped by! This dress is simply lovely, as are you! Thanks so much for participating in Visible Monday. You look so comfortable and warm in that dress Jeannie. Love the boots also! What a nice cozy house you have.. Thanks Sylvia! We are expecting snow tomorrow here in Georgia! Crazy weather we’re having. 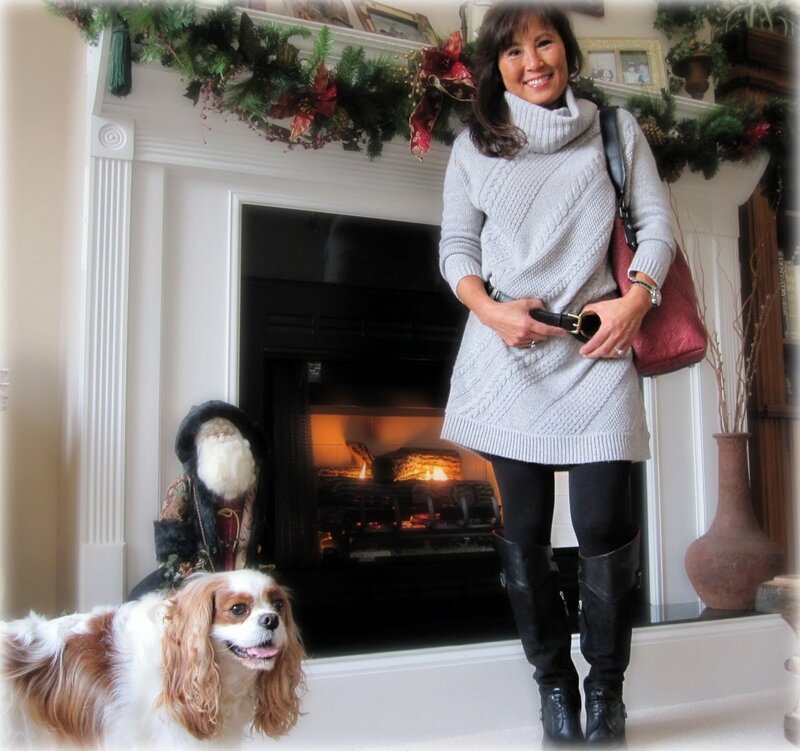 Snow is good…fireplace, apple cider,my kindle, and more cozy sweaters! Thank you Lady J! We do love our furkids…don’t we? I LOVE those boots! you look wonderful. Hi Ms Diva! Thank you so much! Awww, what a sweet hubby you have. We have no chance of white christmas’ here, but I do miss the magic of snow. The way the world goes quiet when it starts falling, even if in the middle of the night. Love your sweater dress, i wore one similar, but with much shorter sleeves this week. Hi Wendy! There’s nothing like a white Christmas…fireplace…hot cocoa…music…family! I love this whole outfit! You are so beautiful. Hi Bailey, You are too sweet! Thanks!